Clara Mari is a French illustrator with a distinctive universe. With a stroke of her pen, she can transport you into a world filled with iconic art, haute couture, and fantasies of hip destinations. Catch a wave in Los Angeles, share a cigarette with Yves-Saint Laurent or get a glimpse of the latest Paris fashion show. Colorful, dreamlike and intellectual: her illustrations have already seduced an international clientele. From magazines to interiors and from postcards to her brand, she distillates her eclectic taste on a variety of mediums. 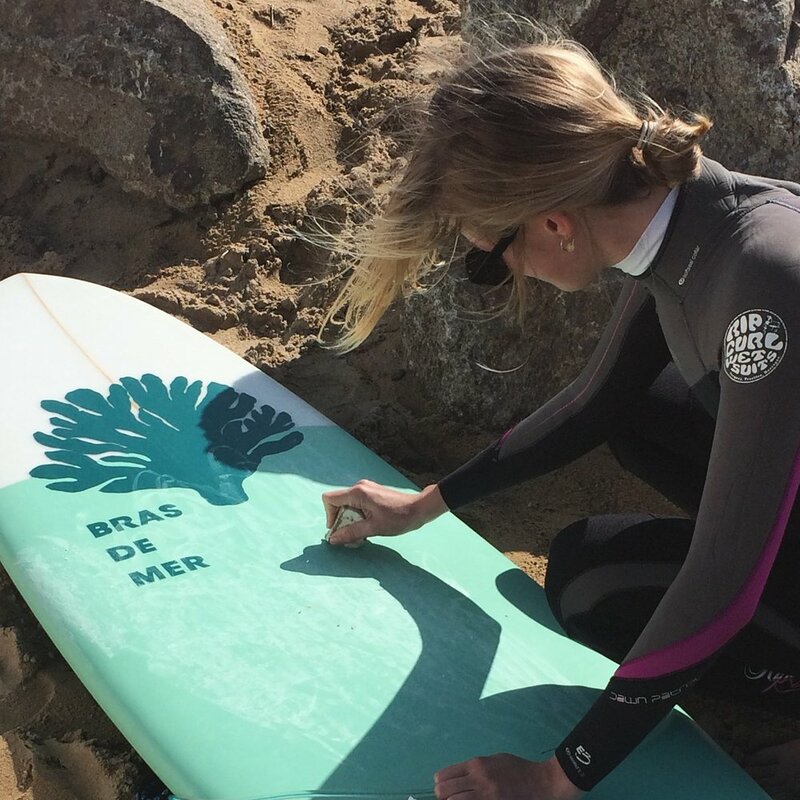 Clara has even launched her brand, Bras de Mer, an homage to her native Brittany. Clara launched her career as a freelance illustrator only two years ago in Paris. Clara is an artist I discovered on Instagram last year. I remember the strong impression I felt upon landing on her page. One of my coups de coeur was her drawing following the David Hockney exhibition in Paris. The explosion of colors! The warmth! The subject itself: I was subjugated. Her style seems to have coalesced into a vibrant, international reverie with a French je-ne-sais-quoi. Very chic, yet relaxed. Right away, I could recognize many of my passions and influences in her work. Fashion, travel, art history or architecture are recurrent themes in her production. At the time, I wasn't sure whether she lived in L.A. or Paris. I could recognize influences from both French and American cultures. Clara was one of the first women I thought of interviewing when I thought of launching The Creatress. I had a trip to Paris in the books and a short list of women I wanted to meet there, Clara was the only one I didn't know. Emboldened by my new project -- and after hearing the advice from my friend Zoé to prepare for "a ton of rejection," I decided to go for it and reached out. Clara had recently contributed to the last Paper Magazine for the closure of Colette, the Parisian institution. I understood from her Instagram posts that she was about to move to the United States and I wanted to catch her before the move. Luckily, we were able to meet for tea before we both flew out of Paris. Talented illustrators have a unique way of putting a little bit of themselves in their work. Even before we met, I already felt in sync with her as I enjoyed seeing the world through her eyes so much... After seeing her online pictures, I was expecting to meet a young woman with a big smile and mischievous eyes. I was waiting for her, in a creperie near Marché Saint-Germain. The place displayed all the trendy items including caned chairs, velvet loveseats, and graphic tiles. Would I recognize her in this anonymous place? I thought she would look like a French, blonde Molly Ringwald, hazelnut eyes, and full lips -- with an artsy streak. She indeed put her best smile forward as she crossed the door, and we recognized each other. In my haste, I forgot to bring along my pen and notebook. So our interview started with me, disheveled and mortified, negotiating with an aloof waiter to get a pen and paper. I started The Creatress because I knew that many women lack role models in creative careers. There is no "how to" or sacred path, with a stamped diploma at the end. The job of illustrator remains elusive to many, including myself. Is it enough to draw all the time? How do you find your style? How do you get published? Can you make a living by drawing things all day, anyway? And so on. Now in her late twenties, Clara has managed to grow her career and live from her art for the last couple of years. So I asked her to walk me through her career path. As a child, Clara grew up drawing all the time and decided that she wanted to learn the craft of illustration. Amusingly enough, despite her mother being a high school guidance counselor, her path to Art School was somewhat tortuous. Clara studied at Les Beaux-Arts in Nantes, a prestigious and selective public school. She had high expectations: she wanted to learn technique and delve into Art History. Alas, the school fell short on the technical side. The curriculum focused on contemporary art, including performance, photography and professional printing. All interesting topics, but at the time she started wondering whether she had made the right choice. Most students saw these years as a fertile ground for experimentation. It took Clara some time to get into the flow, and she felt a bit frustrated by the technical training that she found too casual. During that time, she also had the opportunity to spend a year in a student-exchange program at tje Glasgow School of Art. This experience confirmed her desire to specialize in fine art… and awakened a new passion for living abroad. Thus, at the time of graduation, Clara decided to develop her fine art practice further. After a few more tribulations, she finally found her happy place. She enrolled at Le Campus de la Fonderie et de l'Image near Paris. There, she was admitted to a traineeship program, and a company paid for her courses. Her job: Graphic Designer at Rougier & Plé, a famous chain of Arts and Crafts stores in France. She worked there for two years. Among her activities, she started a blog of DIY (Do It Yourself) for them, a new trend in France at the time. She was responsible for giving life to the aesthetic branding, from their catalogs to retail displays. She also helped set up the first workshops in stores, another booming trend. In parallel, the school provided her with a solid background in trades such as typography and publishing. Having dabbled with website creation, Clara later pursued a Master's degree in Web Design. Unfortunately, the trendy profession of graphic designer didn't entirely feed her artistic soul. After a series of jobs in visual arts, she realized that she missed her first love: illustration. In 2015, listening to her heart, Clara made a big, scary jump and launched her career as a freelance illustrator. The first year, it took a lot of time to build a network, acquire clients and of course, sign contracts. In the beginning, contracts were few and far between. Developing the business became a time-sink. But Clara didn't despair and kept her commitment to improving and growing her craft. She immersed herself in topics that would become her trademark by attending a flurry of exhibitions. That way, Clara created a personal inventory where fashion, photography, and art coexisted. At some point, she had to face the everyday dilemma of any beginning freelancer: how to sustain a basic income? Resourceful, she would run creative workshops with children for the City of Paris. She kept this gig for six months but realized that this was a bad compromise. Alas, it didn't give her the freedom and time she needed to keep improving her craft. She thus decided to refocus on her illustrator career. It was in the second year of her freelance illustrator business that her career took off. At that time, she evolved her strategy spending a large amount of time growing her network. She started to attend gallery openings (vernissages) where she met other Parisian illustrators. She also headed to the shows of the Paris Fashion Week, where a lot of the action took place outside the entrance. On a lucky day, she could sneak into a show. And at any time, the same group of people, guests or bystanders, gathered at the entrance. The real game changer was when she started putting her work on Instagram. Almost immediately, she found clients through the platform. On Instagram, Clara publishes both professional projects and personal pieces. Inspired by the work of other creatives, she sometimes publishes illustrations influenced by their work: an homage to a collection, to an exhibition… Many respond favorably. A few even ask her to collaborate or directly inquire about special orders. Today, this is how Clara finds most of her clients -- or rather, how her clients find her. Being able to find work thanks to the platform is a big relief. She is now able to reach clients all over the world -- and she doesn't have to cold-call them and pitch over the phone, like in the "old days." Clara splits her contracts between recurring clients and one-time orders ("one shot"). Among her recurring clients, there is the homeware company, Série Limitée Louise. Together they have been collaborating for two years in a row, each time creating somewhat a buzz at the Salon Maison & Objet in Paris. This year, they were also showcasing their work at New-York Now, the homeware marketplace. Each time, Clara designed the visuals, besides several contributions to the collection. Last year, the bottle of champagne she drew caught my eye. This year, Clara illustrated quotes from beloved author Proust and drew French feminist icon Simone de Beauvoir. 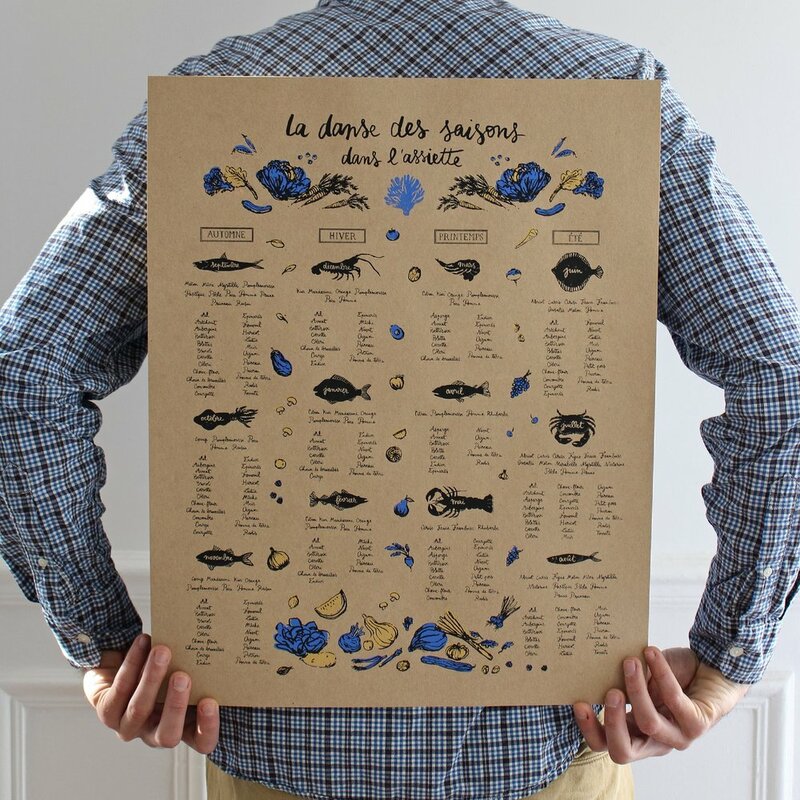 The tea towel celebrating Paris is so adorable that it would deserve to be framed. Her clients are very international. Besides doing surface design for textile brands or paper goods, Clara also works with interior designers. For example, the Charleston-based Basic Projects enjoyed her work and ordered a custom drawing for a client -- a surfer. Her work is also editorial: besides Paper, her illustrations are also in French or German magazines. On top of all her client work, Clara has launched her brand in 2016, Bras de Mer. This project is an homage to her native Brittany: an online brand dedicated to her love of the sea. A surfer longing for the salty air and the crashing waves when she moved to Paris, she started it as a side project. Bras de Mer can be interpreted in different ways in French: literally, it means an inlet. But it also sounds like "bras de mère," a mother's arms. The name is thus an ode to both the motherland and motherly love. A tribute to friends, family and the feeling of being home. This project, although deeply personal, enriched Clara's professional life beyond all expectations. Indeed, this gave Clara an opportunity to develop a broad array of skills, and to deepen her knowledge of art direction. Above all, Clara wanted to develop a brand and tell a visual story. The central object of the brand (“l'objet phare,” pun in French intended...) is a handmade beanie in alpaca. She also wanted to develop a sustainable product. The beanie is handmade by Clara's family and friends, including her mother-in-law! All are unique pieces, numbered, treasures to keep for a lifetime. The beanie can be worn by children and adults: a beanie for life! The brand's color palette: gray, navy, blue and a hint of yellow is very evocative of a walk on the beach. Among the objects I love: a seasonal calendar for cooking fish and a beautiful surfboard. For the visuals, Clara even uses her friends as models. She desires to keep a small production and focus on the aesthetic branding. In a way, Clara and her set of kinfolk knitting beanies in Brittany is the epitome of the "live authentic" trend turned cult by Kinfolk magazine and the like. A movement that I have become wary of -- so much of it is just pure marketing nowadays. Clara's approach and her focus on the Art direction are very endearing, though. Not only has she proven her abilities as an Art Director, but she also dabbles in production, supply, and online selling. Seeing the process from design to production, she has acquired knowledge on logistics. These are valuable skills that she uses when she consults for clients. Don't be paralyzed by overthinking! Just go for it. Clara launched Bras de Mer with a minimal business plan, her key focus for this venture was to experiment and gain experience as an Art Director. She made decisions accordingly, such as selling online. This allowed her to diminish distractions and spend her energy on building the visual brand. Sign up with your email address to receive weekly updates from The Creatress! Héloise: a free spirit who puts her big heart in a beautiful tiny box.